January 11, 2019 – ASTON, Pa. New Way Air Bearings proudly hosted local middle school students for the What’s So Cool About Manufacturing? program for the second consecutive year. 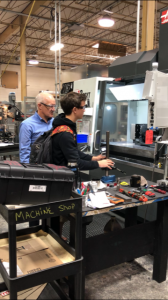 The program pairs local middle schools with manufacturing companies in order to give students a first-hand look at the face of today’s high-tech manufacturing industry. Students spend a few days at their assigned company then create a video showcasing what they experienced and learned. Sarah Stahl, one of the 8th graders, was intrigued to learn how one of the most popular New Way products, air bars, floats the glass enabling more highly-precise processing and inspection so vital in flat panel cell phone screens and televisions. “It’s been a really cool experience,” Stahl said. What’s So Cool About Manufacturing? was started in 2013 by the Manufacturers Resource Center in Allentown, Pa. and has met with such success it has now expanded to 15 regions in Pennsylvania and 11 additional states.